Stephen Forsey looks a bit tired as we sit to down for a chat in the factory’s conference room, all the while looking at the 17 calibers housed in the unique watches that his boutique brand has brought forth since 2004. Naturally, talking about the watches in such overview led to a conversation about the remarkable decade he has experienced. Forsey is somewhat knackered because he’s just come back from one of his many trips abroad, where he visits with collectors, talks shop with enthusiasts, and brings the particular, highly technical brand of haute horlogerie that he and business partner Robert Greubel have taught themselves to perfect, right to the people. Forsey was trained as a very technical watchmaker, and is hailed by colleagues, admirers and critics as a great talent. But part of his job description has definitely come to include being the “face” of the brand. And this he does easily: when Forsey begins to talk about technical concepts that are so far above the heads of the average watch enthusiast that they could quite conceivably make one’s head explode, it never comes across as anything but genuinely passionate when Forsey’s well-spoken British lilt and dry humor come into play. And they come into play almost immediately. I have known Forsey throughout the decade that his company has been in existence, and not once has he ever tired of attempting to help me understand one of his impossibly brainy concepts, almost all of which focus on improving tourbillon technology. 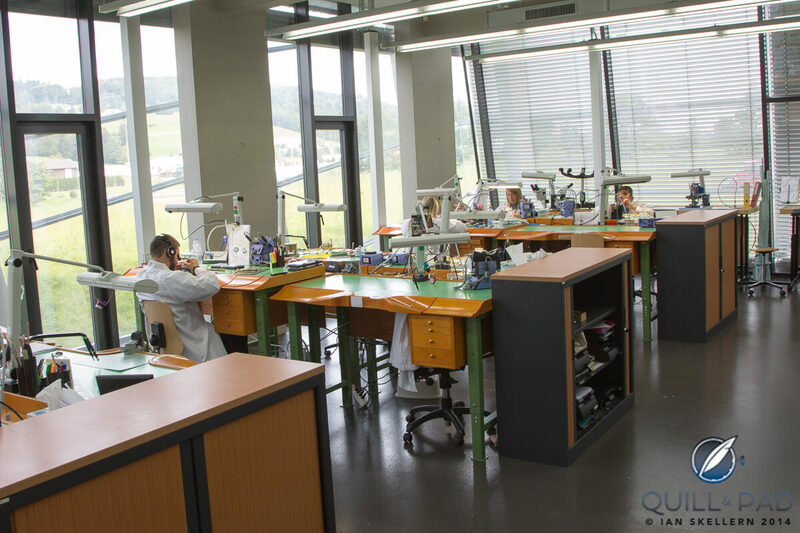 On this sunny day in the La Chaux-de-Fonds factory, which is half charming eighteenth-century farmhouse and half state-of-the-art technical facility, I was entirely surprised by having learned something new about one of Greubel Forsey’s production elements: screws. The subject came up in passing at lunch, sparking great passion in Forsey despite what might seem to be a miniscule topic to the uninitiated. Though it is easy to be awed by the intense attention to minute finishing Greubel Forsey exacts on each and every component and movement, it is almost easier to feel a certain sense of admiration for the brand’s inimitable quest for technical perfection. There are very few companies concentrating so intensely on the seemingly mundane details that are such a part of the entire weave of elements making up a Greubel Forsey oeuvre. And it was exactly my discovery of one of these “mundane” elements that astonished me so completely, even though I was fully aware of the loving attention to detail that every person who works here lavishes upon the product. I have been in Greubel Forsey’s five-year-old factory on several different occasions; upon leaving this time, it occurred to me that on each visit I tend to discover something I hadn’t noticed before. This time, the discovered “treasure” was found in a sunny, mid-sized room at the back of the ground floor, which contains four long lathes manufacturing turned parts. I learned, to my utter surprise, that in this room Greubel Forsey manufactures every single screw used in its movements: tiny 17-karat gold examples to aid in adjusting the inertia of the balance wheel, and several sizes of steel examples manufactured from a special steel alloy perfect for thermally bluing in the rotating oven that ensures an even, cornflower blue across the entire screw. I only know of one other factory that makes its own screws, and I’m not sure that the factory still does. The reason for this is because these threaded little pieces of steel are such time-consuming, finicky little components. They are far easier and much more cost-effective to purchase in bulk from a specialized supplier. However, Mssrs. Greubel and Forsey are nothing if not perfectionists. And after receiving one sorry load of screws that were manufactured out of the wrong kind of steel (because that was what the supplier “had in the machine”), resulting in unevenly blued screws, which ultimately held up production of a few watches by several months, the boutique brand’s eponymous founders made the decision to take this in hand themselves. That, simply put, is dedication. And it allows Greubel Forsey to make its screws to exactly the required size rather than having to make do with the closest fit out of a catalogue. This is especially true for the screw heads, which are often extra-large off-the-rack so they work well with a machine. Nestled in a corner of Hall 5.1, near the A.H.C.I.’s busy beehive of a booth, Greubel Forsey debuted the Double Tourbillon 30°, almost immediately earning the respect of journalists and collectors. It didn’t take long before Greubel Forsey became a household name, especially in the world of high-quality timepieces. While the visuals of the timepieces that came after it were anything but ordinary, the Double Tourbillon 30° Vision had a somewhat more conventional dial layout than the brand would later exhibit in order to fully showcase the double tourbillon, inclined at a 30-degree angle to improve the original premise of Abraham-Louis Breguet’s invention. Remember that in 2004 there were perhaps two other watchmakers making timepieces that included anything other than a single-axis tourbillon. And no one was experimenting with degrees of inclination to improve performance. Greubel Forsey became known as a multi-axis tourbillon specialist, which is important when you take into consideration that in 1999, when the duo left the security of salaried positions, there were only about 35 brands offering tourbillon models at all. In the ten years since that launch, Greubel Forsey has introduced an astounding 17 different calibers. Of these 17 movements, only one element remains constantly the same if it happens to be included, which it is in the majority of the brand’s watches: the tourbillon. How truly ironic that the most difficult and time-consuming elements to manufacture, finish, and regulate comprise the only subassembly that a Greubel Forsey watchmaker, each of whom assembles a watch from A to Z, can make with any sort of routine. Seventeen calibers, almost 900 individual timepieces, two intensely creative founders, and a path that very few others have trodden. This is Greubel Forsey today, ten years later. Screws and all. Keep checking back as over the next few months, we will continue to present a few anniversary views of Greubel Forsey. For Ian’s personal look back, please read Greubel Forsey Celebrates 10th Anniversary And I Reminisce Back When…. For GaryG’s overview of highly desirable Greubel Forsey timepieces, please read Objects Of Desire: Greubel Forsey. And for Joshua’s look at the 30° tourbillon, please read The Greubel Forsey Double Tourbillon 30° Technique: What’s Friction Got To Do, Got To Do With It! ?